Dr Russell Buchan joins JiC for this guest-post on the ICC Prosecutor’s decision to close its investigation of Israel’s attack on the Gaza Flotilla. Russell a Senior Lecturer in International Law at the University of Sheffield and the author of International Law and the Construction of the Liberal Peace. On 31 May 2010, a flotilla of vessels set sail with the express intention of delivering humanitarian aid to Gaza. They set out on the mission despite the fact that it meant violating a naval blockade that Israel had imposed against the Gazan coast in order to prevent war material from being delivered to Hamas fighters. Whilst the flotilla was in international waters, and anticipating that the flotilla was about to breach the naval blockade, the Israeli military intercepted the vessels. This occurred largely without incident. However several vessels, including the Mavi Marmara, the Rachel Corrie and the Eleftheri Mesogios/Sofia, resisted capture. In response, Israeli military personnel forcefully boarded these vessels. 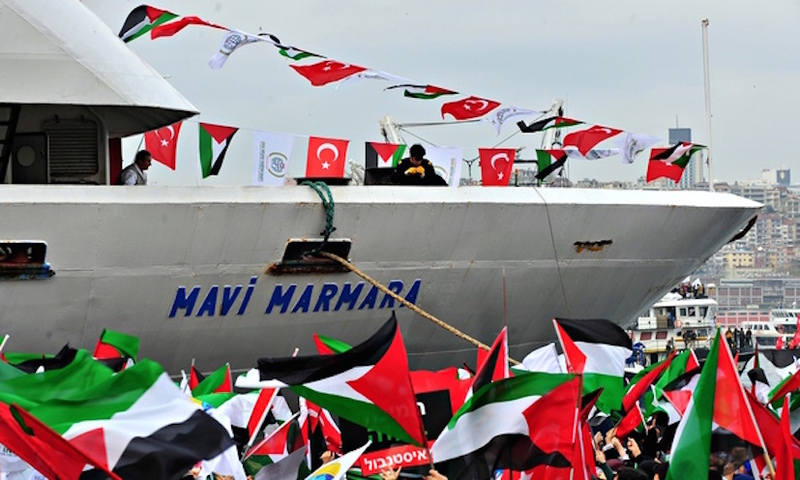 The violence that ensued was particularly severe on the Mavi Marmara, with Israeli forces shooting and killing 9 crew members and injuring at least 50 others. In addition, whilst the captured crew members were being ferried to Israel, they were subjected to considerable levels of physical and verbal abuse by Israeli forces. Despite international pressure, Israel has refused to prosecute its forces for the alleged commission of international crimes or to surrender them to other states that are willing to conduct such trials. The Comoros, a small East-African state to which the Mavi Marmara was registered, therefore referred the situation to the ICC. As a result, the ICC’s Office of the Prosecutor (OTP) opened a preliminary investigation in order to determine whether the incident was admissible before the ICC. On 6 November 2014 the OTP announced that the preliminary investigation had been concluded and that, although there is a reasonable basis to believe that Israeli forces committed war crimes, no individual prosecutions would be brought because the situation is of insufficient gravity; namely, that the international crimes allegedly committed are not sufficiently serious to justify the use of the ICC’s limited time and resources. In short, what this means is that the case is now closed. The OTP’s decision is likely to prove extremely controversial, for many reasons. In this blog I want focus upon the Prosecutor’s conclusion that the situation is of insufficient gravity and, in particular, challenge the OTP’s determination as to the scope of the situation to be considered. In determining whether a situation is of sufficient gravity, the OTP must first define the parameters of the situation that is to be assessed. To put the same matter differently, what conduct can the OTP consider when determining whether or not the situation is of sufficient gravity? In the context of the current discussion the OTP determined that the situation included only those international crimes that were allegedly committed within the jurisdiction of the ICC. The OTP explained that although Israel is not a state party to the ICC Article 12(2)(a) of the ICC Statute confers jurisdiction where international crimes are committed on the territory (which expressly includes vessels) of parties to the ICC Statute. Thus, the OTP concluded that the ICC possesses jurisdiction over crimes committed on the Mavi Marmara (registered to the Comoros, a state party of the ICC), Rachel Corrie (registered to Cambodia, also a state party) and Sofia (registered to Greece, also a state party). Accordingly, the Prosecutor found that the situation is limited to events that occurred on these vessels and that it is within these parameters that the gravity threshold must be applied. Crucially, however, the OTP decided that the situation did not extend ‘to any events that, while related to the events on board these vessels, occurred after individuals were taken off those vessels’ (paragraph 143); notably, the physical and verbal abuse perpetrated by Israeli forces against crew members of the Flotilla as they were being ferried back to Israel. As a result of narrowing the situation to only those events that occurred on the Mavi, Rachel and Sofia, the OTP concluded that the situation was of insufficient gravity. This is a very narrow interpretation of the ICC’s jurisdiction which, despite satisfying a literal reading of the ICC Statute, is wholly inconsistent with its object and purpose, namely to end impunity for those that commit international crimes. What the OTP is essentially saying is that individuals are protected by the ICC Statute when on a vessel that is registered to a party of the ICC but if they are physically apprehended by a non-state party and forcibly transferred to a different vessel, then that protection is lost. The upshot of the OTP’s decision is that if Palestine was to become a member of the ICC Statute then Israel could forcibly transfer Palestinians from occupied territory (which is actually prohibited by Article 49 of the Fourth Geneva Convention 1949) in order to evade the provisions of the ICC Statute and circumvent the protections offered by the ICC. This is a regrettable conclusion that is at odds with the spirit of the ICC Statute. If the OTP had defined the situation as including the events that occurred whilst on Israeli vessels then it is likely that the gravity threshold would have been met. As I explain in detail in my article on the OTP’s decision (see here), in its report in September 2010 the UN Human Rights Council made it clear that whilst detained by Israeli forces the crew members were systematically subjected to ‘extreme brutality’ that in certain instances amounted to ‘torture’ and that this treatment occurred over a period of 12 hours. Such aggravating factors significantly amplify the seriousness of the situation and render it of sufficient gravity to warrant the attention of the ICC. All in all, the Prosecutor’s unjustifiably narrow definition of the ICC’s jurisdiction is likely to seriously jeopardize the capacity of the ICC to achieve its overriding objective of ‘end[ing] impunity for international crimes’ and, ultimately, secure international criminal justice. This entry was posted in Admissibility, Gravity, ICC Prosecutor, International Criminal Court (ICC), Israel, Palestine, Turkey and tagged Comoros, Mavi Marmara. Bookmark the permalink. Dr. Buchan, I think your conclusion is plausible, but the way you get there is highly unsatisfactory. To claim that something “…is wholly inconsistent with [the Rome Statute’s] object and purpose, namely to end impunity for those that commit international crimes.” is the equivalent of saying that I don’t like your decision, so take that. I don’t have the references at hand, but this kind of facile argument can be made about any decision of the ICC you disagree with. The Rome Statute’s object and purpose is the establishment of an International Criminal Court and its operation in accordance with certain rules and procedures. It is not the promotion of human rights, the ending of impunity, making the world a better place, etc. Yes, “to end impunity” appears in the Preamble, but that does not make ‘ending impunity’ the ultimate object and purpose that overrides all other objects and purposes. The problem with your kind of argumentation is easy enough to see — whenever a difficult decision is made that does not promote (your version of) accountability, it ipso facto violates the object and purpose, or to use an even more entertaining phrase “the spirit”, of the ICC Statute. In other words, convict them all. Procedure? No matter, convict. Insufficient evidence? No matter, convict. Now, I am caricaturing your argument just a little, but I do this only because I don’t understand why scholars continue to use this argument. The OtP’s decision is unsatisfactory, and it can be criticised on many grounds, some of which you allude to. The nexus to territory aspect seems like a promising argument for starters. But to say the decision is invalid because it does not help to “end impunity” and is inconsistent with the “spirit” of the ICC Statute doesn’t really tell us much at all.